If it’s dependable power and torque you want for installing earth anchors, Premier has the attachments and technology for you. We manufacture a wide variety of both single-speed and two-speed drive units that can handle the demands of the toughest jobs today’s anchor and pier installers take on. Besides providing the speed you need, our drive-unit technology ensures that each and every anchor you install is screwed in with the proper torque. We stand behind our earth anchor drive units, too, bringing the full force of our U.S.-based manufacturing capabilities to bear on them. With constantly changing building codes and building practices, there’s no doubt that helical earth anchors will continue to be a fixture of the construction trade. Premier prides itself in keeping up with the demand for ever larger drive units capable of delivering the ever higher torque necessary to install these anchors securely. Right now, we’re building units that can generate more than 35,000 foot-pounds of torque! Consider our full line of hydraulic two-speed shift-on-demand drive units. We’ve given them all the speed and torque you need to power through the toughest soil conditions. That, plus the fact that their complete shift-on-demand capability negates the need for extra wiring, can go a long way toward reducing hassles and increasing your productivity. Premier also manufactures a full line of single-speed, industrial-grade drive units. We build these to work with a wide range of equipment – everything from skid steer loaders, to mini excavators and large excavators, to cranes and beyond. Our drive units satisfy many torque requirements as well. The upshot is, you’ll have more than sufficient power to deal effectively with all kinds of ground conditions. We give you more than power, though. We also provide the technology that enables you to monitor the torque being applied and validate that it’s the proper torque for the anchor or pier installation at hand. This is our 98%-accurate Power Pin technology that additionally lets you record and number every anchor installation for future reference, ensuring continued success every time. 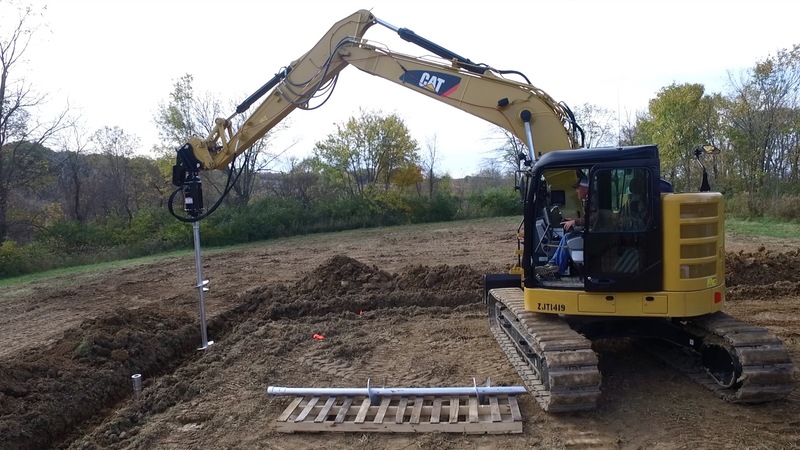 Note also that we manufacture our complete line of earth anchor and helical pier systems in our own Fort Wayne, Indiana, facility. We manufacture all the mounting brackets here too – mounting brackets that make it possible for you to attach these systems to just about any machine. Have an unusual application? We can help you with that as well. Our engineers love a challenge and will work with you to devise an anchor drive unit solution that fits your needs to a tee.